If you had to pick one person, to take one shot for a million dollars, Sharelle McMahon would be the ‘go to’ player. McMahon was one of Australia’s most successful and enduring netballers – and in the clutch, one of the most accurate in front of goal. In an international career that spanned 14 years - playing for Australia 118 times, with 12 as captain, McMahon won two gold and two silver medals across four Commonwealth Games. She carried the flag for Australia at the Delhi Games, was a part of three Netball World Cup teams for two wins and she finished with 2,520 international goals at an average of just over 21 per Test. This Thursday night, Sharelle McMahon will be inducted into the Sport Australia Hall of Fame as an athlete member for the sport of netball. McMahon was just sixteen when invited by Sport Australia Hall of Fame member Marg Caldow to join the Victorian Institute of Sport – requiring the decision to leave her family and hometown in country Victoria to head to the big smoke. It was a massive move for McMahon, who began playing netball at the age of seven in a team coached by her mother Olive in the town of Bamawm, near Echuca. “It was a pretty big thing for a country kid. It was a massive decision to go. When Marg rang I was away on an athletics camp with Debbie Flintoff-King. Marg spoke to mum about it and when I got home I just said, ‘no thanks - I don’t think I’ll be doing that.’” McMahon recalls. “I went home a lot because I was very home sick and it was a tough two years particularly in the VCE period. I got through it and it was probably the making of me because it was very tough for those couple of years,” she reflected. McMahon progressed quickly through Victorian junior netball ranks. She gained selection in the Melbourne Phoenix team in the newly created national netball league and the Australian Under 21 side in 1996. Two years later she was playing for Australia. McMahon made her debut for the Australian Diamonds in 1998 and was the youngest member of the team that won the netball gold medal at the 1998 Commonwealth Games in Kuala Lumpur. “When I first made the team I couldn’t believe it. When I was named in the squad it was amazing and I was at selection camp with my absolute heroes,” McMahon said. Not only did McMahon find herself in the team for the Commonwealth Games, but on court making a major contribution as Australia eclipsed arch rivals New Zealand to win the first ever netball gold at the Games. From there McMahon’s career continued on its rocket-like trajectory. Most famously she took the final shot in the dying seconds of the gripping 1999 World Netball Cup final, capturing the title for the Diamonds in a heart-stopper against New Zealand. It wasn’t the first or last time that McMahon displayed nerves of steel – at the 2002 Commonwealth Games in Manchester, Australia won in double extra time courtesy of McMahon’s sharp shooting. She was a fixture in the goal circle for Melbourne Phoenix for 11 seasons, including four as captain. She also led the Melbourne Vixens from their inaugural season in 2008, leading the team to their first championship win in 2009. McMahon ruptured her Achilles tendon in an ANZ Championship game in 2011, forcing her withdrawal from the 2011 Netball World Cup. Considering her future she briefly returned to the court before taking time off for the birth of son Xavier in 2012. She returned for one more season before retirement in 2013. Since learning of her induction, McMahon has taken time to reflect on becoming just the sixth netballer to enter the Sport Australia Hall of Fame. McMahon is a still a fixture courtside as a commentator and mentor and is thrilled with the current state of netball as it enters a whole new chapter with the new national league. “Part of me thinks wouldn’t it be great if I was twenty years younger. It’s just joy and pride - there’s a lot of pride. It’s been a long journey and we’re still on that journey of course, but I think particularly in the last five years we’ve taken that step that we’ve always believed we could take. We’ve always believed in the product and how amazing it is - so it’s great to see we’ve taken the next step,” McMahon says. 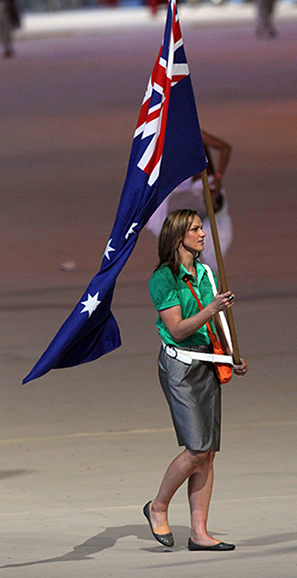 Sharelle McMahon will be inducted to the Sport Australia Hall of Fame on Australian sport’s night of nights – the sold out 32nd Sport Australia Hall of Fame Induction and Awards Gala Dinner, held at Palladium at Crown, Melbourne on Thursday 13th October – presented by Etihad Airways.